by Edward C. Shaw, M.D. Historically, William Kennedy was one of a small group of men who promoted the expansion of Canada into the North and West of British North America. Geographically, his life encompassed the Oregon territory and the Orkney Islands, the North Passage and the Horn of South America. Psychologically, he developed from a child, born of white and Indian parentage in the backwoods of British North America, into a man of letters and persuasion. His portrait suggests a man of strength and character. Why has he been overlooked in Canadian history? Was it because he was part Indian? Was it because he opposed the powerful fur trade and territorial monopoly in Ruperts land? Or, has it just been happenstance? An example of this lack of recognition can be found in "Arctic Canada from the Air," a book written by two Canadians and published by the Canadian Government in 1956. Neither the government nor the authors recognized William Kennedy as a Canadian. He was called a "whaling skipper from Aberdeen." In contrast, a letter, dated the 23rd August 1969, from the Scott Polar Research Institute at Cambridge, England, regarding the opening of Red River House Museum, stated that "His (Kennedy's) position in the history of Arctic exploration is an important one." Only in 1970 does William Kennedy receive some mention in a history text, the Centennial History of Manitoba by James A. Jackson. It seems strange that a man who was the only Canadian of white and Indian blood to command a sea born expedition into the high Arctic should be ignored, especially, when that activity was coupled with his agitation for a greater Canada. William's first years were spent among the fur traders, Indians and voyageurs of the post and canoe routes. In 1819, however, Sir John Franklin arrived at Cumberland House by canoe from York Factory. Imagine the effect on the five year old William. It was the custom of the fur brigades to stop short of an important post, to put on their finery and to resume the trip, singing lustily as they came into view of the post. Thus the young veteran of the great battles of Copenhagen, Trafalgar and New Orleans would have stepped from a boat into the unsophisticated world of the five year old boy. The event was enhanced by the arrival of the Governor Williams. He had come to take charge of the district in the absence of Chief Factor Alexander Kennedy. William's father had gone on leave for a year to Britain. He was accompanied by his sons, John and Alexander, junior. Aggathas and the three younger children remained at Cumberland House. Regular Christian services and a Sunday school were begun on the order of Governor Williams. Franklin approved of the measures and William Kennedy said later that the explorer conducted the first religious service that he could remember. Kennedy also said that Franklin taught him his first ABC's. In January, 1820, Lieutenant Franklin left Cumberland House for the Coppermine River and the Arctic coast of British North America. William Kennedy never saw the explorer again but fate decreed that the little boy would one day grow up and go in search of his hero. In 1820, the family moved to Norway House at the northern end of Lake Winnipeg to join Chief Factor Alexander Kennedy who had returned from Britain to take charge of that post. It was there that William, his sister Betsy and his brother George were baptised by the first minister in the west. appropriately named, John West. This man of boyish appearance had come to bring the gospel to Red River. In 1822, Alexander Kennedy was appointed to take charge of Fort Spokane in the Columbia Department of the Hudson's Bay Company. The Kennedy family were rarely mentioned in the Company records. A correlation between the birth dates of the children and the various posts, suggests that the family were with the Chief Factor wherever he assumed responsibility for a fort. Later, in 1826, when he commanded Albany Factory, the family journeyed from the north to join him. When he retired to Red River, Aggathas and their sons, Alexander and Phillip, made the settlement their home also. This pattern of having his family with him indicates that they journeyed with the Chief Factor to Fort Spokane. The route from Norway House would have traversed the north western part of Lake Winnipeg to the Grand Rapids of the Saskatchewan. The winding course of the Saskatchewan River would have carried them to Cumberland Lake, past their old home. into the Sturgeon Weir River to enter the upper reaches of the Churchill River. They would have crossed the Methye portage and descended the Clearwater. They would then have arduously ascended the icy waters of the Athabasca. The final obstacle was the 5,000 foot Athabasca Pass which led across the first range of the Rocky Mountains. A precipitous descent of three thousand feet to the Boat Encampment on the Columbia River gave access to a relatively leisurely trip to the Spokane. In 1824, Alexander Kennedy was given command of Fort George, at the mouth of the Columbia. The family would have travelled past the Dalles, an area of waterfalls and plateau, where the Chinooks, or Flathead Indians, would meet to trade with inland Indians. The Flatheads would have presented a strange appearance to young William. As babies, their foreheads were flattened by using boards which caused their heads to have a pointed cranium. At the coast, the Salish, with their seagoing canoes, carved and ornamented, and with their somewhat oriental hats and strange garb, would have presented an appearance, very different from that of the Swampy Cree of William's childhood. The vast expanse of the Pacific Ocean and the pounding surf would have been all the more mysterious, since Fort George was supplied from England. Company ships sailed around the Horn of South America to the Sandwich Islands (Hawaii) and, thence, another two thousand miles to the mouth of the Columbia. One day William Kennedy would make the trip around the Horn. In that same year, 1824, Governor Simpson came into the Columbia Department to re-organize it. Dr. John McLoughlin was appointed to succeed Alexander Kennedy. Before Kennedy left, he and McLoughlin were ordered to find a site on the northern bank of the Columbia as a replacement for Fort George. The Oregon Territory was under discussion. Governor Simpson considered that the Columbia River would likely be the dividing line between the American and British jurisdictions. In American history, Dr. McLoughlin is considered the Father of Oregon territory but it was Alexander Kennedy who chose the site of Fort Vancouver which is, today, Vancouver, Washington. William and George went to school at St. Margaret's Hope in South Ronaldsay, the southernmost, inhabited island of the Orkneys. The island was separated from the mainland by the six, turbulent miles of the Pentland Firth. The wild storms tended to isolate the islands. In this society of fisher folk whose sons fled their bleak existence to seek their fortunes in the fur trade of the New World or, on the whaling ships bound for Arctic waters, William Kennedy spent seven years. He learned his school lessons which included the French language but he also became a keen marksman. Although he was later to be referred to as a whaling captain, the only whaling he saw in the Orkneys and possibly engaged in, was a peculiar hunt in which a group of whales would be driven into a cove. The trapped animals would be forced into shallow water and butchered on the beaches. William's older brothers, John and Alexander, had also been educated in the islands. That seemingly rude environment developed character as well as providing an education for the Kennedy boys. In 1833, the year after his father had died, William wrote to the executor of the estate. He asked to be allowed to study medicine. He wished to emulate his oldest brother, John, who had been trained as a physician in Edinburgh, subsequent to the Orkney education, and who had been employed as a doctor in the Columbia department, from 1829. However, Alexander Kennedy, once again on leave in Britain, had died in London, England, in 1832. Therefore, William's request to be allowed to study medicine, addressed to the executor of the estate, was denied. In 1833, at the age eighteen, William Kennedy returned to the Canadas to serve the Hudson's Bay Company in the Ottawa valley, mainly at Fort Coulonge. He became bilingual, as was, particularly, necessary in that area of the fur trade. In 1838, he travelled on the Company's schooner, Tadoussac, "from Canada via Esquimaux Bay to Fort Chimo," to serve under John McLean. William was a valued servant of the Company. Subsequently, he was in charge of Fort Trial and Fort Nascopie. He quit the Company in 1846. He said that he could no longer agree with policy of giving liquor to the Indians. William Kennedy set up a fishery on the Saugeen River in Upper Canada. He soon began to lobby against the monopoly of the Hudson's Bay Company in Rupertsland. It is interesting that George Brown, editor of the Daily Globe of Toronto, began to write on the expansion of the Canadas, about this same time. Brown printed excerpts from a letter that William Kennedy wrote to Lord Elgin, the Governor General of the Canadian Provinces, in 1848. Kennedy and Brown were later to develop a closer association. Eventually, Captain Kennedy sailed from Aberdeen, Scotland. The expedition was backed by Lady Franklin and public subscription. The Prince Albert was a wooden vessel of eighty-nine tons. Kennedy described it as "a small fairy-looking craft, which might have been taken for a yacht, or pleasure boat. He had a crew of seventeen men. His second in command was Joseph Rene Bellot, a lieutenant of the French Navy who had volunteered for the expedition. Among the crew were some men who had been in the Canadian Provinces and Rupertsland. Kennedy was well acquainted with the Arctic from his service at Fort Chimo. He wished, no doubt, to include these men for their tested survival abilities. Again drawing on his Arctic experience, William Kennedy had a tin kayak constructed. It was water-proofed with rubber. Rear Admiral Noel Wright, stated in "Quest for Franklin" that Kennedy's expedition was one of the best organized up to that time. The ship and its little crew sailed across the North Atlantic and into Baffin Bay. Kennedy stopped at Upernavik in Greenland to take on dogs and sleds. Kennedy then took his ship into the "middle ice," a great stream of ice flows and icebergs that comes from the glaciers of Greenland and Ellesmere Island. He was accompanied part way through the ice by two American ships, commanded by Lieutenant Edwin De Haven of the American Navy. The ships were privately financed by Henry Grinnel to search for Sir John Franklin. The medical officer was Elisha Kent Kane also on leave from the American Navy. He would later command an expedition of his own in 1854. Kennedy and Kane visited back and forth as the ships lay locked in the ice. By sawing and blasting their way through, the men of the Prince Albert left the Americans behind and gained entry into Lancaster Sound, the first part of the North West Passage. According to his instructions, Kennedy then entered Prince Regent Inlet. At one point, he was separated from his ship by a shift in the ice. He had four of his crew with him. Kennedy had studied the reports of previous explorers. This enabled him to lead his men to a cache of food and supplies left at a bay named Port Leopold. Good commander that he was, he kept his men busy building a snug shelter and the various requirements for survival. Instead of wasting his energies searching for the Prince Albert, Kennedy, wisely, remained at Port Leopold. He was waiting for the proper weather and conditions. In the meantime, Bellot who had brought the ship into winter quarters at Batty Bay, had made two attempts to reach Kennedy and the four men. Finally, on a third attempt, Bellot and his party succeeded, with great difficulty, in reaching Kennedy just as the latter had decided that the conditions were right and was about to start south in search of the Prince Albert. The reunited crew returned to the ship to prepare for the search to the south west. Kennedy made several preparatory journeys to lay down caches for the main attempt to come later. These were the earliest winter sledge trips to that time. Finally, Kennedy and his men set out on a great trek that was to cover two thousand miles. In the course of this journey, he discovered that Bellot Strait which he modestly named after his second in command. In delineating the northern coast of the peninsula of Boothia, he found the northern-most tip of the North American continent. At a crucial time, when he should have turned farther south, Kennedy was suffering from snow-blindness. Therefore, he was not actually in command. Bellot and Leask, the sailing master, chose to travel due west. Armchair experts have blamed Kennedy for not following Lady Franklin's orders. His integrity, prior to and subsequent to that deviation, was never in question. Therefore, it seems unlikely that he would wilfully have disregarded his orders. Consider the Indian legends of the supernatural intertwined with the Orcadian superstitions that influenced Kennedy in his childhood and youth. What would have been his reaction to the ghostly instructions of "Weesy" Coppin? Kennedy had gone to Londonderry in Northern Ireland to verify the story. He had come away convinced that the message of the whereabouts of the lost Franklin expedition as given by the ghost of the dead daughter of Captain Coppin was the truth. Certainly this was another powerful reason to follow his orders had Kennedy been able to do so. The temporary loss of command due to snow blindness seems to be a logical reason. Kennedy and his men completed their long journey across Prince of Wales Island through then unknown territory. They returned along the southern shores of the North West Passage. They suffered terribly from scurvy. Bellot gave full credit to Kennedy when he wrote, "... to Captain Kennedy alone belong the praises due to the boldness and intelligence of the measures taken for the accomplishment of our mission; and the constant care he took to secure the health and welfare of us all ... we were indebted for being able ... to do much in a little time, and to return ... without having to regret those frightful mutilations, those losses of limbs, which are often the results of cruises in icy seas." Bellot also paid tribute to Kennedy's experience in Arctic survival with these words, "... thanks to the able arrangements of Captain Kennedy we adopted ... for our travels the manner and customs of the Esquimaux and Indians; and it was not difficult for us to see how nature has provided them with the means far superior to any which the refinements of civilization could afford us. Garments of skin and moccasins of sealskin boots. Contrast this with the Naval serge uniforms and the monogramed silver of the Franklin and other Arctic expeditions of that time. For those proper gentlemen it was difficult to see the superiority of native clothing and ideas. 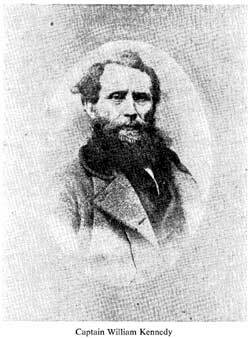 Late in 1856 Captain Kennedy returned to Upper Canada. He resumed his agitation which he had begun in the 1840s. He argued for the expansion of Upper and Lower Canada into the north and west. In the winter of 1857, he started from Toronto about the 22nd of January. His purpose was to prove that an all Canadian route from Toronto to Red River was possible, even in the dead of winter. A month and five days later, Captain Kennedy arrived in the Red River Settlement on the 27th of February. According to Rev. John Black, Kennedy "caused a considerable sensation ... and picked up a petition of 500 to 600 names." Recorder Johnson attempted to speak on behalf of the Hudson's Bay Company's continued regime but was shouted down in the Scotch schoolhouse by a crowd who were impressed by William Kennedy's vision of a greater Canada. He was aware that most of the commerce from the east to Red River went via the United States. Americans were beginning to appear in the Settlement. There was a danger that the whole of the north west would fall into American hands as had the Oregon territory, by the sheer weight of numbers of immigrants. That was twelve years before the Riel uprising. Had Kennedy's arguments prevailed there might have been an earlier union of the west with the Canadian Provinces of the time. In these efforts, Kennedy was allied with his nephew, Alexander Kennedy Isbister, M.A., L.L.B., a barrister, of London, England. They formed a two-pronged attack on the monopoly of the Hudson's Bay Company. It had served its purpose in opening up the country. Times were changing. Governor Simpson and the Company were fighting a losing battle. Captain Kennedy had married Eleanor Cripps, a kinswoman of Lady Franklin. She was a talented musician and singer. She was also an accomplished painter. A book of her original paintings survives in the library of the Museum of Man and Nature in Winnipeg. The Captain and his wife came to Red River in 1860. Kennedy's desire to upgrade the native population caused him to return to the west as a missionary. He attempted to establish a mission to the Indians of the Lake of the Woods. His approach was a practical one of coupling religion with fair trade. He proposed to deal with the Indians without the use of liquor. His backers failed to supply the trade goods. The Indians returned to their usual traders and the scheme collapsed. In the 1860s, the Kennedy's built a stone house on the banks of the Red River on a knoll, overlooking old St. Andrew's Church. The northeastern side had a log cabin attached to it. The latter was probably the original house on the site. The land had been owned by the Kennedy family since Chief Factor Alexander Kennedy had retired to Red River in 1830. The stone house was originally occupied by the Captain and his wife and their two children. They had a daughter, Mary, and a son, William. Both were born in the early 1860s. No direct descendants of the William Kennedys survive today. In the 1880s William Kennedy, then a man in his seventies, was still alive to the issues of the day. There was a considerable outcry against the Canadian Pacific Railway freight rates. The people of the West protested that the development of prairie institutions were being strangled by the monopoly granted to the railroad by the Federal Government. Since no other railway was permitted in an east to west direction, or vice versa, Captain Kennedy advised his nephew by marriage, Premier John Norquay, that the difficulty could be overcome by building a rail line to Churchill. He said it would be the port of the future. There was enabling legislation passed to that end. An early attempt resulted in fifty miles of track. When a railway was finally built to the shores of the Hudson Bay, York Factory was to be the terminal. However, it was discovered that silting would be too great a problem. Accordingly, the railroad was built to Churchill. William Kennedy called for a city at Churchill such as existed at St. Petersburg in his day. It is interesting to note that a recent Northern Transportation Commission Report states that with proper facilities, the port of Churchill could be open for six months of the year - as long as the St. Lawrence Seaway is open! Captain Kennedy was ahead of his time in many ways and he never ceased to fight for what he thought was right. Dr. F. V. Bird, a General Practitioner for fifty years in the town of Boissevain, Manitoba, is a descendant of Chief Factor Curtis Bird, a contemporary of Chief Factor Alexander Kennedy. Dr. Bird was born in 1885 at Lot 70 in St. Andrews on the Red. The Doctor recalled William Kennedy as a man of medium height and "highly respected" in the community. He was five years old when the Captain died in 1890, in the old stone house at Lot 63. If the lack of recognition of Captain William Kennedy stemmed from his failure to find Sir John Franklin, that position would seem to be irrational. If we consider the total number of expeditions that searched for Franklin, there were twenty-three. Kennedy commanded the thirteenth. It took ten more expeditions to find an inkling as to the fate of the lost explorers. Captain Kennedy set the stage for that final discovery by indicating the existence of the Bellot Strait. Francis Leopold McClintock, the twenty-third commander, after failing to penetrate Peel Sound, followed Captain Kennedy's idea of going south west from the Bellot Strait. This enabled him to discover a message in a stone cairn on King William Island which indicated the fate of the lost Franklin party. In recognition of his debt to Captain Kennedy, McClintock named his base of operations Port Kennedy. He also recognized that Kennedy had been "induced" to deviate from his orders. Thus an actual Arctic explorer, not an armchair expert, defended William Kennedy. Another contemporary, Dr. Elisha Kent Kane,  whom Kennedy had met in the ice of Baffin Bay in 1851, commanded his own search in 1854 and 1855. He discovered Kane's Sea, now called Kane Basin. The channel leading from it to the north, he named Kennedy Channel. The men of the Belcher squadron who explored in the area of the Bathurst group of islands named one point of land Cape Kennedy. Thus three sites in the Arctic discovered by others bear the name Kennedy. He lies buried in the churchyard at St. Andrews with a natural grey, granite rock for his headstone. Even in death he continues to be unusual among the hewn and finished tablets of the other graves. A further memorial to Captain William Kennedy exists in the National Portrait Galley in London, England. His portrait is among those of the great of British history. It is time that the life of this man, lived in integrity and unselfishness, in faith and temperance, should find an afterglow in the history of this nation of Canada. 1. Manitoba, Provincial Archives, Capt. Wm. Kennedy Letters, Folio 9, A. K. Isbister to Wm. Kennedy, 1 April 1879. 2. Winnipeg Free Press, A Pioneer's Death - References at St. John's. 27 January 1890. 3. W. J. Healy, Women of Red River, Winnipeg: Peguis Publishers, 1967, p. 145. 4. M. Dunbar and K. R. Greenaway, Arctic Canada from the Air, Ottawa, Queen's Printer, 1956, p. 158. 5. Letter from Allan Cooke, Curator of Manuscripts, Scott Polar Research Institute, Cambridge, England, August 1969. 6. James A. Jackson, The Centennial History of Manitoba, Toronto, McClelland and Stewart, 1970, p. 79. 7. E. E. Rich, R. H. Fleming, Editors, Colin Robertson's Correspondence Book, Toronto and London, Chaplain Society and Hudson's Bay Record Society, 1939, pp. 224-25. 8. H.B.C. Archives, A.36/8, fo. 99, William Kennedy to William Smith, 28 July 1832. 9. Ibid, G.11/96 A Sketch of Cumberland House and Gardens, 1815. 10. John Franklin, Capt., R.N., F.R.S., Narrative of a Journey to the Shores of the Polar Sea., Edmonton, M. G. Hurtig, 1969, p. 48. 11. H.B.C. Archives, B.239a/127 York Factory Journal and Country Correspondence, 1819 & 20, Sept. 25th; C.1/788 Log of the Prince of Wales, Captain Davison, 27 Sept., 1819. 12. Franklin, op. cit., pp. 52, 53. 13. Winnipeg Evening Tribune, A Prophet of the North, 30 Sept. 1929. 14. Franklin, op. cit., p. 59. 17. Manitoba Provincial Archives, Alexander Kennedy Letters, St. Margaret's Hope, 1 Feb. 1832. 19. Douglas Mackay, The Honourable Company, Toronto, McClelland and Stewart, 1966, p. 191. 20. Arthur S. Morton, Sir George Simpson, Toronto, J. M. Dent & Sons, 1944, pp. 125-132. 23. Alexander Kennedy Letters, op. cit. 24. H.B.C. Archives A36/8, fo. 97, Papers of Alexander Kennedy, William Kennedy to William Smith, 12 July 1832. 25. H.B.R. Society Vol. IV, 1941, p. 346. 26. H.B.R. Society Vol. XXIV, 1963, p. 357. 27. Daily Globe, Toronto, The Hudson's Bay Company, 16 Sept. 1848. 28. William Kennedy, A Short Narrative of the Second Voyage of the Prince Albert, London, W. H. Dalton, 1853, p. vi, vii. 32. Noel Wright, Quest for Franklin, London, Heinemann, 1959, p. 119. 33. William Kennedy, op. cit., p. 51. 38. J. Henry Skewes, The Fate of Sir John Franklin Revealed After 40 Years, London, Penrose & Sons, 1890. 39. Julien Lemer, Memoirs and Journal of Lieutenant Bellot, London, Hurst and Blackett, 1855, Vol. 1, p. 93. 40. Ibid., pp. 104, 105. 42. Edward C. Shaw, personal experience on flights to Resolute Bay, N.W.T. in summer and winter as R.C.A.F. Wing Commander, 1961. 43. William Kennedy, Report on the Return of Lady Franklin's vessel the Prince Albert, under command of Mr. Wm. Kennedy, from the Arctic Regions. Journal of the Royal Geographical Society, London, 1853, p. 122-29. 44. William Kennedy, op. cit. 45. A. J. Clark, Captain William Kennedy - a Sketch, The Canadian Magazine, 1910, p. 452. 46. Manitoba Provincial Archives, Captain William Kennedy Letters, folio 4, undated. 47. Ibid., Folio 6, 25 June 1856. 48. Daily Globe, Hudson's Bay Territory - Action by the Board of Trade, Toronto, 4 Dec. 1856. 49. Daily Globe, The Great North West, Toronto, 22 Jan. 1857. 50. W. L. Morton, Red River on the Change, The Beaver Magazine, Winnipeg, Hudson's Bay Company, Autumn 1962, p. 49. 51. Manitoba Provincial Archives, Rev. John Black Letters, no. 210. 52. Roy St. George Stubbs, Four Recorders of Rupertsland, Winnipeg, Peguis Publishers, 1967, p. 60. 53. Donald Swainson, The North West Transportation Company, Trans. Man. Hist. Soc., 1969-70. 54. W. J. Healy, Women of Red River, Women's Canadian Club, Winnipeg, 1923, p. 157. 55. The Nor'Wester, Capt. Kennedy, Red River Settlement, 28 Feb. 1860. 56. Photograph of Dun Allister, (Red River House Museum), given to Edward C. Shaw by Mrs. Mary Savage, Winnipeg. 57. Alexander Kennedy Letters, op. cit. 58. Archer Martin, Hudson's Bay Land Tenures, London, 1898, p. 147. H.B.C. Archives, Register of H.B.C. Grants, Red River Settlement, lot 75. 59. A. J. Clark, op. cit., p. 453. 60. Manitoba Provincial Archives, Papers of the Manitoba Historical and Scientific Society, Minutes, pp. 12-13. 61. Winnipeg Weekly Tribune and Times, Towards The Pole, 12 March 1879. 62. William Kennedy, op. cit. 63. Winnipeg Free Press, op. cit. 64. Edward C. Shaw, personal communications on tape, from Dr. F. V. Bird, Boissevain, Manitoba. 65. Sir F. L. McClintock, The Voyage of the Fox, VI ed., London, John Murray, 1895, p. xv. 66. William Kennedy, a short narrative. op. cit. 67. Winnipeg Free Press, Captain Kennedy's Tablet Unveiled, 30 April 1910. 68. A. J. Clark, op. cit. * Dr. Shaw illustrated this paper with seventy-two colored slides. Reproduction of parts for academic purposes is permitted but for other purposes is not permitted. Copyright is reserved by the author, Edward C. Shaw.